The superb Garlando Master Champion ITSF Table Football Table is truly a gem of a table and has the full range of features you would expect from the official ITSF international competition tables. 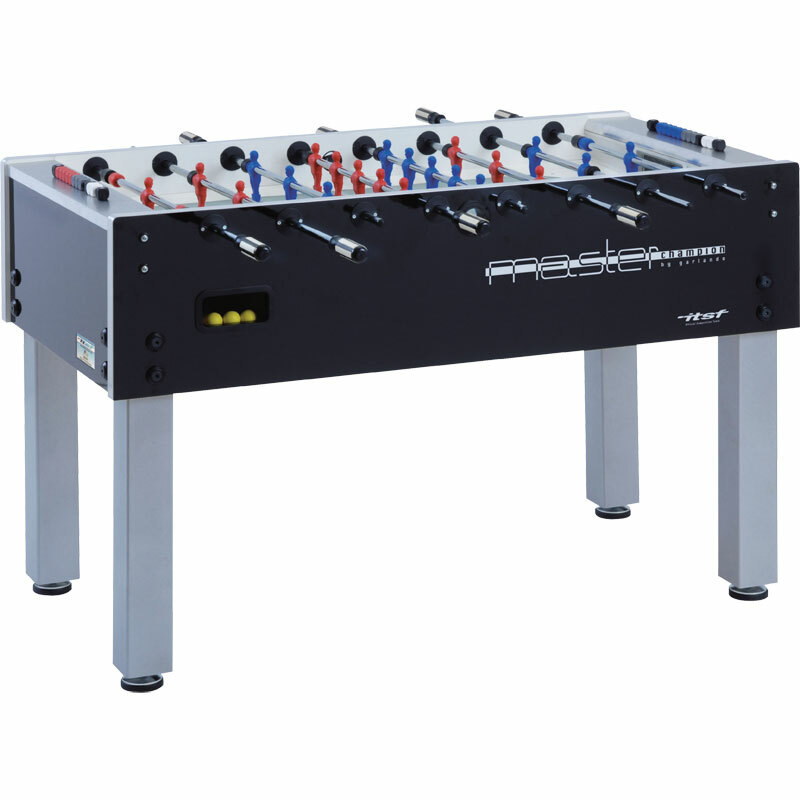 The Garlando Master Champion ITSF table football table has been built to exactly the same standards as the coin operated Garlando World Champion table football table.This free play version is used in the International Championships, Pro Tour and Master Series. Made of heavy duty 30mm thick cabinet constructed from multi-layered plywood and is coated with plastic laminate with an aluminium border. This soccer table comes with a silkscreen ''Master Champion'' printing and individual numbered plate and Competition certificate of authentication to confirm its ITSF standard and suitability. 9 x 9cm square metal legs are coated with a scratch-resistant powder varnish finish to ensure the rigidity of the table and the longevity of the look. Each leg is also fitted with competition standard levellers to provide the ultimate level playing field and to enable the perfect flat playing surface. The pitch on this remarkable Garlando Master Champion ITSF Table Football Table is made from tempered, non-reflective sanded glass and looks stunning. The underlying pitch is green with white lines. This provides the smoothest free rolling surface for play, as well as a realistic look and perfect playing condition for any environment. Fitted with 16mm diameter (3mm thickness) high stress-resistance bars with rubber bumpers for total coverage and playability, and even the goalkeeper has rubber spacers to keep him in the goal mouth. Everything required under ITSF regulations. Professional standard handles are plastic with wooden inserts to reduce perspiration and improve grip, and to ensure optimum purchase on the ball every time. Colour players are made from unbreakable plastic and are individually moulded to the bars. Blue and red colour, you can have the ultimate grudge match with the local teams, and decide who is to take the bragging rights! Competition grade abacus score counters enable the marking of sets and goals and make it simple to keep track of the games progress at all times. The goals are made from High Density Polymer (HDP) reinforced with fibreglass for the best look and performance, and ensure they will last a lifetime. The goal mouths have been specially moulded using an innovative design to prevent irregular ball trajectories, and ensure the genuine response to every shot / play. There is even a balancing unit in the goal itself to absorb the bumps and prevent unusual ball bounce. Quick and easy ball recovery from ball pockets on each side ensure you can get the game started quickly and easily, and make it convenient to recover the balls after the goals are scored. Supplied with 3 yellow Speed Play balls for ultimate competition play.